CELEBRATE the Mooncake Festival with delicately hand-crafted Mandarin Oriental mooncakes with new flavours as well as much-loved classics. The hand-made baked and snow skin mooncakes are the creation of Lai Po Heen?s executive Chinese chef Ricky Thein. ?We look at what is available in the market as well as what is in season, such as the durian,? explained Thein when asked how they decide on the mooncake filling. Thein?s signature Mini Snow Skin with Durian Paste is bite-sized perfection and uses D24 durian for the deliciously custard-like filling. The mini snow skin mooncakes also feature two new varieties, the Mini Snow Skin with ?Kuaci? and Egg Yolk in Pandan Flavour and the Mini Snow Skin with Almond and Sun-Dried Apricot in Black Sesame Paste, reminiscent of the Japanese mochi dessert. The moist duck eggs that are meant to represent the full moon of the festival, are rich and crumbly with a slightly sandy texture. They are fragrantly salted to complement the sweet filling. The large baked mooncakes come in several traditional varieties such as White Lotus Paste, Lotus Paste with Single or Double Egg Yolk and the Red Bean and Lotus Paste with Single Egg Yolk, all of which have deliciously thin baked skin that melts, giving way to the flavours of its silky filling. Medium-baked mooncakes include the intriguing Chestnut Paste with Melon Seeds or Pandan Essence with Macadamia Nut for a smooth centre with a bite. According to Thein, preparations for these delightful mooncakes begin a year in advance by first aging the base dough. ?This year, we will prepare the base dough and a secret ingredient for next year, but the sugar acts as the only preservative.? The chocolate mooncakes, which are medium-sized, include the ever-popular Milk Chocolate with Peanut Butter Crunch that is unexpectedly light with a centre that is crumbly with bits of almost crispy peanut brittle. Other flavours are the White Chocolate with Lychee Filling and Chocolate Caviar, as well as the luxurious Dark 24K Chocolate with Passion Fruit and Caramelised Banana, which uses the aromatic French luxury chocolate, Valhorna. Each of the baked and snow skin mooncakes are individually shaped into wooden moulds which are then either baked, or refrigerated for the snow skin variety, while the chocolate mooncakes are carefully prepared layer upon layer in silicone moulds. 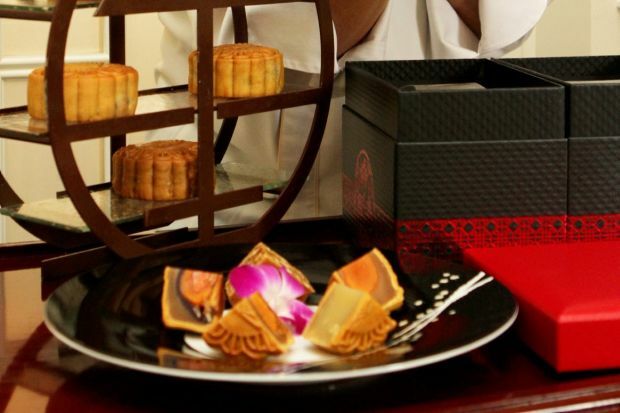 The mooncakes will be available until Sept 19 at Mandarin Oriental as well as 1Utama Shopping Centre, priced at RM14 to RM30 per piece, or presented in an elegant black and red gift box that holds four to six pieces.